The longer you are out walking in the countryside and the further you walk the more you’ll get to truly savour it and there are few better ways of doing this than by embarking upon a long distance walk. It’s far more enchanting than simply going for a stroll for a couple of hours and, whether it’s a 20 mile hike in one day or an even greater distance over several days, you’ll become much more in tune with nature and you’ll be far more able to leave the everyday worries and stress behind you. Like any form of exercise, you should not be daunted by the thought of walking longer distances. However, it is necessary to build up gradually and to let your body get used to walking longer distances over a period of time. If you’re more used to walking ‘on the flat’, it’s also useful to include some hill walking in your training program as many designated longer distance walks can undulate and can include an element of ascending and descending along the way. If you’re walking one of the more popular long distance trails in the UK over several days, there are plenty of resources to tell you what accommodation is available en route. It may be a youth hostel, a B&B or some other form of accommodation and many walkers prefer to book ahead at each of the places along the route as a) it gives them a target to aim at for the distance they want to cover each day and b) if you’re out walking along a popular route, in the summer especially, some accommodations can get booked out ahead of time. However, be it out of choice or if you’re walking in a remote area, many walkers prefer to camp. Not only does this give them the opportunity of remaining closer to nature, it also affords them the opportunity of going at their own pace and, for the most part, stopping off to set up camp whenever and wherever they please – camping rules permitted, of course. Whatever your idea of a long distance walk is, there’ll be a walk to suit you. There are long distance paths and trails all over the UK from canal towpaths to lowland farmland and from hills to coastlines. Some of them even traverse across a variety of landscapes so there are bound to be at least one that suits you. As with all walks, it’s important to plan ahead but most of the popular UK trails are featured online with many suggestions and useful advice to help you with your planning. However, if you’re venturing off the beaten track into more remote wilderness areas, you should still find out as much as you can and make your plans to suit accordingly before setting off. 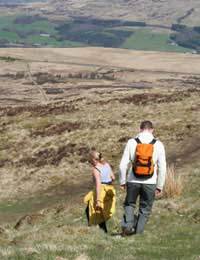 Many walkers prefer the solitude and simply enjoy their own company when out on a long distance walk. For them, it gives the opportunity to really appreciate the natural environment in peace without being disturbed by others. Conversely, some people think it’s more fun and they feel more confident if walking with others. However, if you walk as a group, it’s pretty important that you all share similar goals. A trip can become anything but peaceful if part of the group wants to get from A to B as quickly as possible whilst others want to stop, chill out for a while and photograph the wildlife, for example. Therefore, it’s necessary to establish the compatibility of people before planning a group walk. There is also the Long Walkers’ Association which organise walks in many areas and can help to find you a group to walk with if you haven’t already established one and prefer to walk with others. You’re obviously going to need to carry more if you’re out on longer walks, especially if you’re camping too. You don’t need to pack everything but the kitchen sink and you should still think ‘light’ in terms of what you choose to carry. It’s obvious that you’re likely to need to pack more for a longer trip but remember that it’s you that’s going to have to carry your backpack or rucksack over long distances so ensure that you only carry a weight that you don’t feel will become a burden. That said, ensure that you carry clothes for all weather eventualities – sun, rain, wind, heat, cold etc. Ultimately, a long distance walk should be all about sheer enjoyment and becoming as ‘one’ with the environment around you. It’s a time to step off the hurly-burly merry go round of busy modern life and to recharge your batteries and reinvigorate yourself whilst, keeping fit at the same time, which can’t be bad! Many people walk from hostel to hostel (or pub to pub) so they can spend the night indoors in the warm. This is a great strategy, but you have to be sure to cover the distance in a day, and so not set it right at the upper end of your limits. I think you should give more emphasis to fitness. You need to build up to real long distance walks - most people couldn't do 20 miles a day without plenty of training first. Start small and build up, it can take several months before you're ready for undertake real distance walking. If you have any doubts at all about your health you should talk to your GP first, too.